Portia fabrics recently released its own embroidered collection. 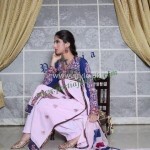 Portia embroidered collection 2012 volume 1 consists of intricately embroidered fabric. The collection is quite appropriate for this eid with its embroidered shirts. Its outfits can also be worn for parties. The fabric quality is excellent and the prints of all the outfits are also good. A wide variety of colors are available in the Portia embroidered collection 2012 volume 1. Fabric for shirt, dupatta and trouser is provided in each suit in this collection. As the outfits are unstitched, you can create stylish party wear outfits from them. Portia Fabrics is a retail chain providing fabrics of different companies. Started several years ago as a fabric retail store, it has now grown quite a lot and become one of the most popular fabric retail stores in Pakistan. It provides fabrics for both men and women. In fact many brands launch there collections through it. A wide variety of fabrics for different occasions are available at Portia Fabrics. You will find bridal wear dresses over there also. It is located in Karachi but it has an online store also where you can shop for clothes and have them delivered to your doorstep.